Arthur G. Henken, age 87 of Carlyle, passed away at St. Joseph’s Hospital in Breese, IL on Sunday, March 17, 2019. Mr. Henken was born in Breese on October 7, 1931, a son of the late Arthur B. and Flora M. (Weirich) Henken. He married Sylvia Heimann on September 3, 1956, and she survives in Carlyle. In addition to his wife Sylvia, Mr. Henken is also survived by his children – Mary Jo Kratschmer (Mark) of Godfrey, IL, Betsy Bacon (Paul) of Danville, VA, Kathy Huelsmann (Mike) of Breese, Terese Kasson (Bob) of Breese, A.J. Henken (Carol) of Webster Groves, MO, and Joe Henken (Cindy) of St. Charles, MO; his grandchildren – Ted (Theresa) and Chris Kratschmer, William and Allison Bacon, Ellen and John Huelsmann, Erin, Joseph, and Will Kasson, Paul, Leo, Emily and George Henken, and Owen and April Henken; a brother – Lee Henken (Beverly); and his in-laws – Ruth Lager (Paul, deceased), Joanne Lampe (James), Esther Norrenberns (Pat), Anita Rakers (Marvin), James Heimann (Kathleen), and Joe Heimann (Annette). In addition to his parents, Mr. Henken was preceded in death by a sister – Phyllis Henken. 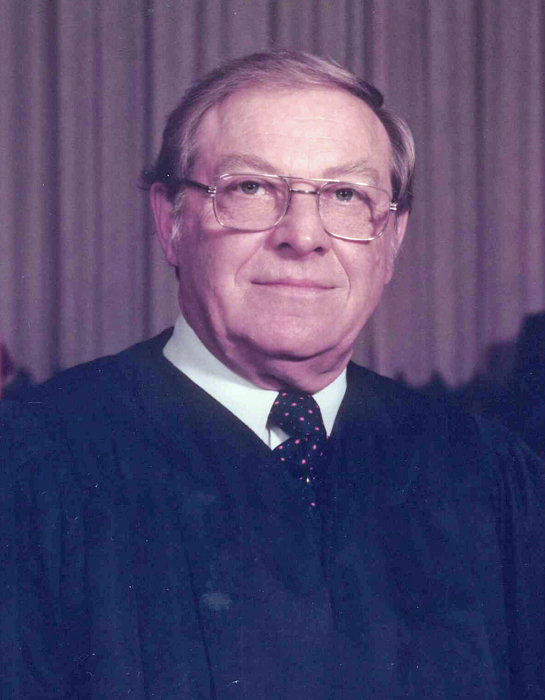 Mr. Henken graduated from the University of Notre Dame in 1953 and was elected as judge of 4th Judicial Circuit in 1962. Art attended night classes at St. Louis University School of Law until earning his diploma in 1966. Mr. Henken served on the bench from 1962 until his retirement in 1992. Art was an active member of St. Mary’s Church, where he was a devoted singer in the choir. He had also served in the United States Army during the Korean War. A Funeral Mass of Christian Burial will be celebrated at 11:30 A.M. on Thursday, March 21, 2019, at St. Mary’s Church in Carlyle, with Fr. George Mauck, officiating. Interment will follow at St. Mary’s Cemetery. Visitation will be held at St. Mary’s Church on Thursday, March 21 from 8:30-11:30 A.M. Expressions of sympathy in memory of Mr. Henken are suggested to St. Mary’s Church Building Fund or to the Mater Dei Foundation.